Travelling thousands of miles from Freetown was not for satisfaction for Sawyer Bredford and Kamara Mohamed but that they are representing Sierra Leone in their first international tournament as an act of fulfillment for the youngsters. As an orphan 12-year-old Sawyer Bredford was always discouraged by his grandmother from playing table tennis, but his love for the sport most of the time made him get punished and sometime miss out on food at home. But the junior class pupil of Albert Academy in Freetown was ready to face the consequences of his love for table tennis. However, his doggedness paid off when he was among the five players selected by the Sierra Leone Table Tennis Association (SLTTA) for the 2017 ITTF African Junior and Cadet Championships in Tunis, Tunisia. 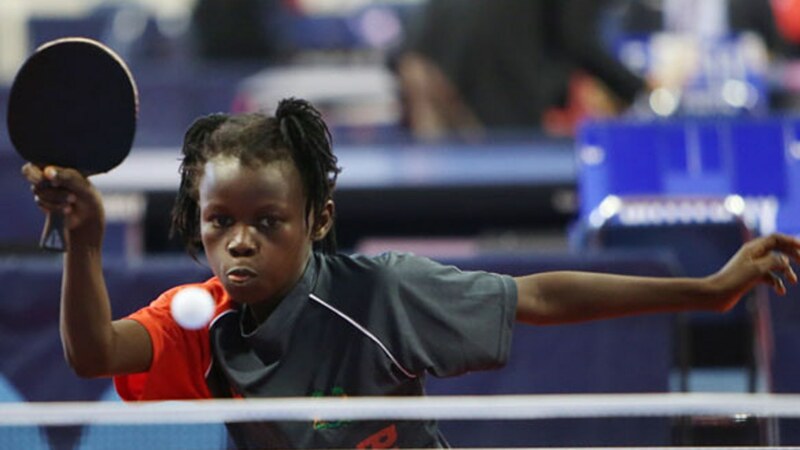 … But when she was later told that I was among the lucky players that will represent my country in Tunisia, she was so emotional and started crying that she would not believe that it was table tennis that will me take me out of Sierra Leone,” Bredford said. Like Bredford, 11-year-old Kamara Mohamed had to endure same punishment to follow his table tennis dream and in Tunis, he is excited wearing the national colours. “I did not believe until I boarded the plane from Freetown and being my first time of boarding a plane, I was so excited that I will be representing my country in an international competition. This is a rare opportunity and I hope to work hard after watching other players in the competition. Also my parents did not believe I would be travelling out of Sierra Leone just by playing table tennis. So they were so happy with me because they never wanted me to play table tennis but face my studies,” 11-year-old Kamara Mohamed said. For the Secretary General of SLTTA, Emmanuel Lebbie, the trip to Tunis was made possible through the support of the President of SLTTA, Alie Lakish, who has been using his hard-earned resources to lift the fortune of the sport in Sierra Leone. “Few days to go until the championships, there was no hope that we could make the trip because nothing was forthcoming but the president was making frantic efforts to secure funds from the government and when it was obvious that the help was not coming, he decided to take the bull by the horn. He got the kits and made some funds available for the team. Also the National Olympic Committee of Sierra Leone supported as well. Prior to this, we have written to several private organisations but no response from them. But a traveling agent based in Freetown known as Karl Travel Agency showed interest in the team and they provided two free flight tickets for the team. I think they must be commended for this singular effort,” Emmanuel Lebbie said.